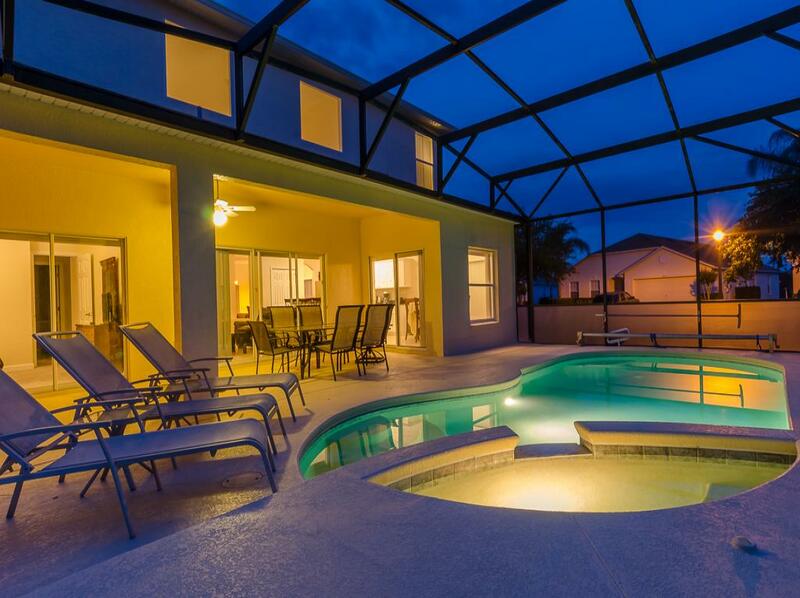 This extremely spacious and beautifully maintained 5 bedroom villa with south facing pool and spa offers all you need for your very special Florida vacation. Located at the "The Sanctuary" at West Haven this sums it up perfectly. 5 minutes drive to Champions Gate for: shops, restaurants, golf and the Interstate 4 with only 2 junctions to Disney This gated community is cared for extremely well with manicured lawns and shrubs, brick paved sidewalks and drives give it that extra feeling of something special. Accommodation comprises of : 5 bedrooms 3 bathrooms private pool (pool heat additional), games area. Downstairs: formal living, dining room, 1 bedroom with Queen size bed and 1 bedroom with twin beds that share one bathroom. Our bright and spacious luxury kitchen has all the modern appliances that you might require along with a side by side fridge and freezer with a built in water and ice dispenser. Next to the kitchen is a breakfast nook. There is also a Family room which features a large TV with cable, a DVD player and has large sliding doors that look out to the spacious lanai and over sized pool deck. Upstairs: Master bedroom en-suite, Queen and twin bedroom that share one bathroom All the bedrooms have ample built in closet space. Also there is a large hall which we have adapted for the little ones, there are scatter cushions, games console, TV, books, Toys. There is a private 30ft x 15ft pool. Pool furniture sits outside on the lanai for you to enjoy alfresco dining or just taking it easy in the Florida sun. There is a games room in the garage with pool table, tennis table, air hockey and footsball. The community also features a tennis court and children’s recreation area with a cabana. The local area has one of the best golf complexes around and features 2 full 18 hole courses designed by Greg Norman and is also home to the David Ledbetter Golf Academy. We are ideally situated 7 miles from Disney, and 1 mile from Champions Gate and is also very close to local shops and restaurants. This is a non smoking, no pet home for your added comfort.